While researching about store-bought bread and the preservatives/additives/improvers added to it, I came across this 2016 report by “Centre for Science and Environment” that talks about potassium bromate and iodate being added to bakery products. Please do take a look. There are many brands that do not mention the use of these 2 toxic chemicals as flour treatment agent in their packaging. That brings us to an important lesson. NOT ALL ingredients that are used are listed in the Ingredients list in packaging. So far, I’ve only been sharing about the ingredients mentioned in packaging, which in itself is quite scary. Imagine what else goes behind the scenes in the factories! By bread, I don’t mean only the loaf we buy from supermarkets. It also includes the pav buns, burger buns, pizza base etc. It also includes the burgers and pizzas we order from Subway, KFC, McDonalds, Pizza Hut, Dominos etc. The report on potassium bromate and iodate includes samples from these junk food brands too. Highly recommend that you take a look at the report mentioned above. Remember my earlier post on iodised salt and how iodine in excess is bad for our health. That’s exactly what’s being talked about in this report. We hardly eat bread as it is. 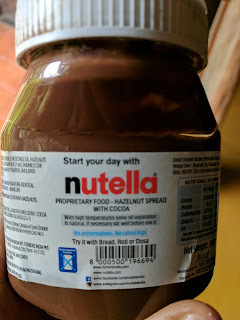 It is always slathered with one or more of these processed foods - jam, cheese spread, mayonnaise, butter spread, cheese slice, ketchup, peanut butter, chocolate spread like Nutella etc. So apart from the preservatives in bread, we are also consuming more toxic chemicals from these complementary products on a daily basis. Not to forget the copious amounts of sugar, salt and unhealthy fats. 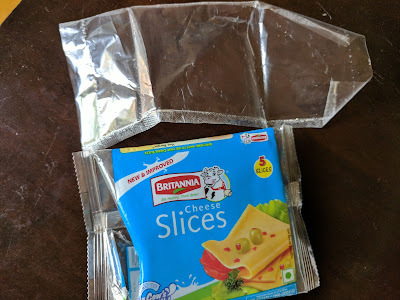 My daughter loves these cheese slices but I buy them rarely. I’m not falling for the “High calcium, goodness of cow’s milk” trap. 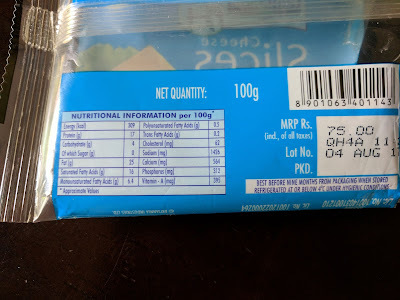 This pack has 5 slices (100 gm). My biggest concern is the number mentioned next to Sodium - 1426 mg per 100 gm. One cheese slice contains a whopping 285 mg of sodium. In the last few years, cheese has become such a favourite snack for children, often perceived as healthy. Many parents pack cheese cubes in young kids’ snack boxes in order to increase their calcium and protein intake. But not many are noticing the numerous additives and the high amounts of sodium that are present in packaged cheese. As like every other junk food brand, the packaging encourages consumers to make it a daily habit by eating Nutella with rotis and dosas. Once we start the habit, kids would never touch their dal, chutney or sambhar. Rather, they would insist on having Nutella with every meal because of the addictive nature of sugar. Sugar is the first listed ingredient. A single serving of Nutella contains more than 2 tsp of sugar (8.5 gm). Edible vegetable oil is listed second. A single serving of Nutella contains 1 tsp of unhealthy fats (4.7 gm). If you (or your kids) are eating bread on a daily basis, then please do take time to learn about the ingredients of the complementary foods that you serve along with bread. Home-made tamarind chutney, green chutney or home-made peanut butter are better options. The best decision you can make for yourself and for your family is to avoid bread and its complementary products totally. Great for our health and for our planet too. Individual plastic wrap for each cheese slice! How ridiculous is that! Your articles are an eye opener for everybody.You write a lot about food and its so useful and meaning ful.please write something about water also that is even more important than food...as maximum people in cities are consuming R.O water,please find some time to research on it also..as i think its like slow poison.